The Wild Storm #7 Review – AiPT! World building, the series’ best action sequence and a great lead into next issue. 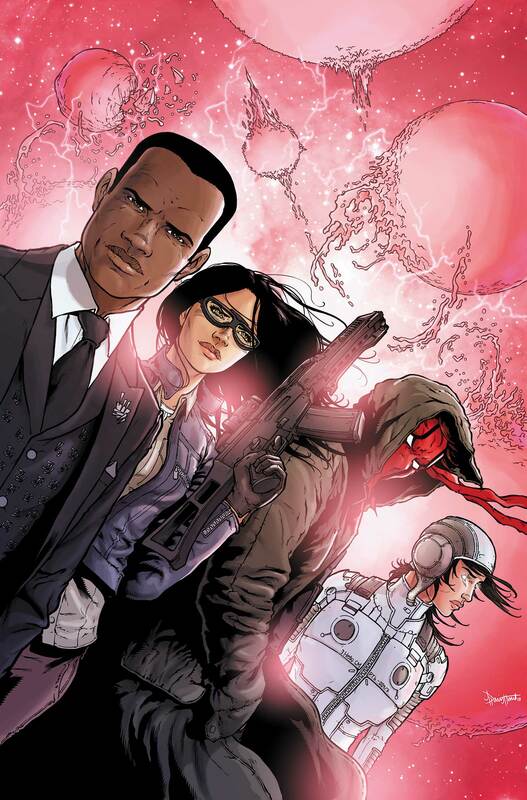 Is The Wild Storm DC’s best series? Though it has thus far been operating as a sort of high concept sci-fi series, The Wild Storm has largely revolved around a central mystery that is the unseen alien conflict that has pit the IO and Skywatch against the Halo corporation. It must be said: that the series has been so tightly scripted and enthralling while introducing way more mysteries than it answers is remarkable. We’re talking season 2 Lost levels of remarkable. With this week’s issue hinting that possibly the biggest mystery (the origin of the Lord Emp’s beef with the aforementioned spy organizations) will be laid bare next issue, let’s hope that Warren Ellis doesn’t pull a Lindelof on us and ruin what has been a pretty promising book thus far. While what most people will take away from this issue is the promise of what’s to come, readers shouldn’t sleep on what’s a pretty stellar issue in and of itself. The real meat of issue #7 is the introduction of John Colt, the reimagined Spartan from the original WildC.A.T.s series. Colt, who looks nothing like previous iterations, is a spy working with the Halo corporation on a deep cover mission in IO headquarters. With his cover blown, he calls on Grifter and Void to teleport him out of the line of fire – something our heroes are hesitant to do, lest they reveal their capabilities to their enemies. John has to find a quiet and secluded spot to get away in secret, but the IO Hightower is on lockdown. So what does he do? If you guessed badass action sequence then you’ve been paying attention. Yep, s--t’s about to go down. Yep, the best part of this issue is a several-page sequence ripped straight from a world of Jason Bourne. Jon Davis-Hunt again proves that his understanding of how to script an action scene is head-and-shoulders above his contemporaries. Though there is a bit of a jump in the sequence where (I think) Colt swings around a corner to take out some guard that does come off a touch abrupt, there’s a gritty tension and believability of motion (within reason I mean. These are super-people after all) that makes for a gripping read. After taking out five armed guards, Colt is able to find an unsecured broom closet and have Adri port him out of the line of fire. Void brings Spartan back to the hideout where it’s revealed that not only is he in possession of important information related to the IO’s nefarious plan to control the human population using “machine telepathy,” but he isn’t really human. Based on Angela’s conversation with Jacob later, it appears that he’s not the bio-android we know and love either. Color me intrigued. We also learn that despite putting a hit on the man, the IO remains unaware of Marlowe’s status as a Kherubim alien, and there may be more to Michael Cray/Deathblow than we previously thought. I suppose we’ll learn more about that in his forthcoming solo series. John Colt? More like John Wick! For her part, Angela’s having a rough go of things as the wound on her side doesn’t seem to be healing right. There’s also the awkwardness of being held as a pseudo captive by a ragtag group of mercenaries that – here’s the kicker – aren’t actually human. Oh sure, Cole seems to be a proper meatbag, and Adriana is mostly human, but Kenesha, Colt and Marlowe would all be on the Men In Black’s radar. What’s more, all three appear to be different kinds of aliens, which is another interesting wrinkle in the story. We also learn that the IO’s research team, self-professed nerds one and all, have made Angela their top priority. Will the Wild Storm version of the Lone Gunmen prove a threat to the Engineer and team Marlowe? I mean, yeah. Probably. This issue has the best action sequence of this series thus far AND manages to advance several storylines even as it creates new mysteries. Why aren't more of you reading this book? Man that action sequence! Davis-Hunt's figures may not be everyone's cup of tea, but his storyboarding is the peak of the art form. The central mystery of the Halo corporation has never been more interesting. Not how I would have imagined a reintroduction of Spartan, but I like this version of John Colt a lot! There are only so many times we can be baited-and-switched on important story elements and maintain enthusiasm for the book. Learn from Lost, Warren!